Well I’ve finished my 1970’s midi jumpsuit, and I quite like it! I don’t think it will be my “go to” outfit, but reserved for those days when I feel like being a bit quirky. I have to say I would not have made this had I not been captivated by the brown tweed version on the envelope,with it’s 60’s/70’s polo neck and boots styling – I can’t think of any other way I would wear this. Polo necks and boots are a bit of a winter uniform with me, and therefore are the perfect (and secure) base for something a bit different! 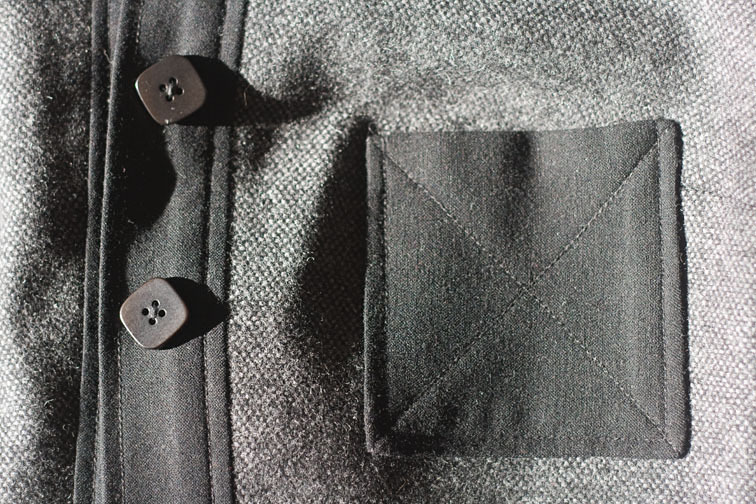 I used a charcoal wool that I purchased from Global Fabrics in May, and some black wool remnants that I had from stash were put to use for the collar, front band, pockets and armhole facings. I added a fourth pocket because I like symmetry – and after looking at all those Chanel jumpsuits in my last post I was on a bit of a Chanel symmetry tangent. I fully lined the jumpsuit. I used the original pattern pieces less the armhole facings, plus 3mm extra on each seam allowance and 25mm added to the crotch length. 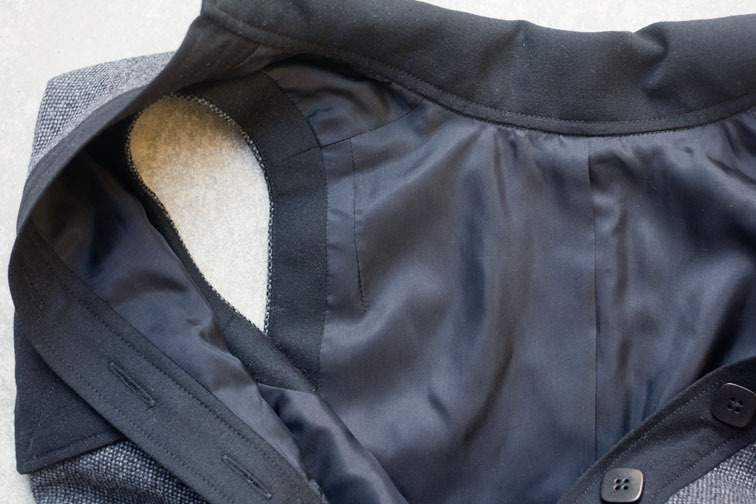 It slips on easily and is so comfortable to wear. back neckline was bunching up, so I lowered it 5mm tapering to zero at the shoulder point. front armhole was gaping, so I swung the excess into the side bust dart. totally redrafted the pant portion! Finally I have got around to redrafting and fitting a trouser block, and I have transferred this to the pattern. Essentially the high hip is wider, the rise is way longer, and the leg angle is altered. 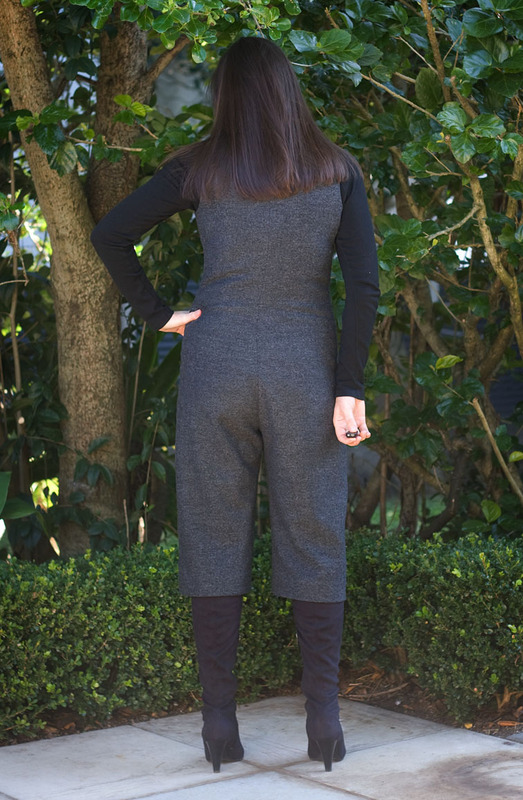 The thing with jumpsuits is you need some extra length in the centre seam for everyday things like reaching up, bending over and sitting down – you need to allow an extra 2cm in the waist to hip/crotch length to enable comfortable jumping around in your jumpsuit! I’m reasonably happy with the back appearance. I’m not really standing evenly here, but the below the hipline it does sit better when I shorten the back waist by 1 cm, however I need that extra ease for bending so I’ve compromised. Plus looking backwards into the mirror gives me a tension headache after a while! And speaking of staying true to instructions…I have a few comments on that for my next post! Funky! I love it. All that work with the tweaking and redrafting really paid off. It looks great. I love the styling. I like that it's a quirky garment but the fabric makes it look like something you could wear anywhere. Clever you! Very cool and funky – good for you! I think that is cute as can be. Funky. You wear it well. It will be noticed, and coveted. You did a wonderful job on this! The inside is so nicely done. I agree with Camelia's comment the fabric you used makes this very wearable. It came out great! Congrats! The fabric really makes this design work. Oh – why did you add 3mm to the lining seam allowances? I've been so excited to see this finished – and I'm not disappoiinted. I really love it! I think it has loads of groovy 70's cool but it also looks bang up to date – very modern and high fashion. And, of course, like all your garments, it looks beautifully made! I agree with Eugenia. I am so glad you decided to make this jumpsuit. I was well worth the wait. You look sharp/baddddddddd/amazing/hip in this outfit. Beautiful job, beautifully made. Looks great! I just discovered your blog, and wanted to thank you for all the exellent information and tutorials you've posted. It is fabulous! This is something that will be noticed when you're walking down the street. Very cool. It looks like it fits absolutely perfectly, too. I'd love to hear more about your trouser block. That's my next big project. I had doubts but it looks great, especially with the boots, fun winter outfit. Yay! I'm so glad you decided to pursue something outside the norm. Very nicely done! Yay, I also couldn't wait to see this! This is just too cool and I would wear this style in a heartbeat… love the charcoal boots!! Nice tip about the extra length, especially in a fitted jumpsuit. I seem to remember as a kid how fitted coveralls rode up in the back in an annoying way. Quite like it? You should love it. I want one too. Beautifully made, as always. That really suits you and your workmanship – perfect as usual. 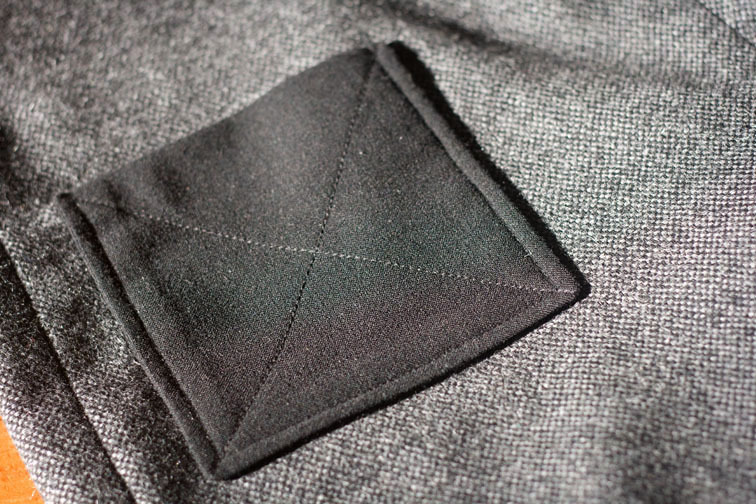 Really like the contrasting fabric and that 'x' on the pocket. Love it!! Awesome jumpsuit. Very funky indeed! I think you're styled it well putting it with the boots and turtleneck. – will also be interested to hear how you find it in terms of warmth -I've been thinking about making a wool dress, but the mild winters we have here makes me wonder if I'll be too hot in it, since there are no “layering” options with an all-in-one. this is so fab. I love this! Very inspiring. I love it! It's very unusual and one of a kind. You rock that jumpsuit! It looks fabulous, and the styling is perfect. What a totally fun outfit – I love all the details in black. I bet you'll get tons of compliments and envious looks when you wear it out. That is super cute, you wear it well! Wow! I was dubious about it, and almost had to cover my eyes when I opened this page, but it actually looks fantastic. It's something I can totally see on the racks of a designer fashion house. Looks wonderful! Of course, the way you styled it is just perfect. I'm so glad you really made this. It is fantastic! The fabric choices really make it modern, I think. Looks super! I love the contrasting & stitchin details & it looks so cool w/ your boots and straight hair. Groovy, man! That does not look seventies, it looks very up to date, very today. the clothes of the seventies were ugly. Wish I could wear that!! I am so jealous. It looks wonderful. So glad you did decide to make it.